Visiting Time: The caves are open all round the year for visits. The cave tour timings are limited to 0900 – 1730 hours. Mondays are the weekly holidays for the authorities. Visiting Duration: Once you enter the caves you will notice there is a lot to explore there. Because of its vast size, it easily takes 2-3 hours for a visitor to tour the caves. It is better to plan the rest of your day accordingly. Ajanta Caves are a peephole into our rich and varied past. These caves are one of the most oldest and exquisite display of cave paintings in India. The caves are filled with colorful paintings and art works all related to Buddhism. This place is an amazing display of Indian craftsmanship and architecture. Apart from its historic appeal, the caves are placed in a very picturesque location of green lush hills. It is all very scenic to take in. The caves are a very ancient and important historical site and protected under various government laws. Do not litter around the place. The cave paintings are very fragile and need careful restoration. Do not touch them or deface any part of the caves. It is punishable by law. Photography is restricted in the caves. The harsh flash from the cameras damage the paintings. Wear comfortable shoes. You will have to walk long distances and trek some parts. Have a heavy brunch before visiting the caves. The eating places are very limited in the area. Spend some moments in the ancient monasteries in the caves. Marvel at the age-old paintings wrapped in a myriad of colors. Discover the amazing architecture that has shaped this monolithic site. Be awe struck at the spectacular scenery that surrounds these caves. Check out the viewpoint near the river. It gives a panoramic view of the amazing Ajanta caves. Guides are available to take you along the tour. It is better to book one from reputed government tourism agencies. It is also a greet supplement if you carry a tourism book of the Ajanta caves, giving you all the extra details. The weather is quite acceptable throughout the year, except in the summers. The most ideal time to visit the cave would be between July – March. The months of April, May and June can get unbearably hot and are unsuitable for travel. Aurangabad is 99 km away from Ajanta caves. It is very easy to reach Aurangabad as it is well connected by airways and railways to the nearby cities like Mumbai, Delhi and Jaipur. For commute inside Aurangabad, one can use either the bus services or the cabs to reach Ajanta caves. It is easy to book your own cab from various local operators. First phase of the caves was built in the period 100 BCE to 100 CE, under the care of the Hindu Satavahana dynasty representing Hinayana tradition of Budhism. The second phase was built under the Hindu emperor Harishena of the Vinayaka dynasty during 460 – 480 CE. He represented the Mahayana tradition. The caves were discovered back in 1819 and from that time till today, the Ajanta caves have only attracted historians, archaeologists and tourists to explore its vibrant mysteries. Ajanta caves are a huge network of 29 caves made from basalt, an igneous rock. The workers carved out the cave structure, bit by bit over many years. The caves are an important part of Buddhism. They are a combination of both the traditions of Buddhism. There are many viharas, monasteries and prayer halls carved in these caves. The paintings are made on dry plaster surface. The murals depict various parts of Lord Buddha’s life. They have very distinguishable features and depict expert artisan work. 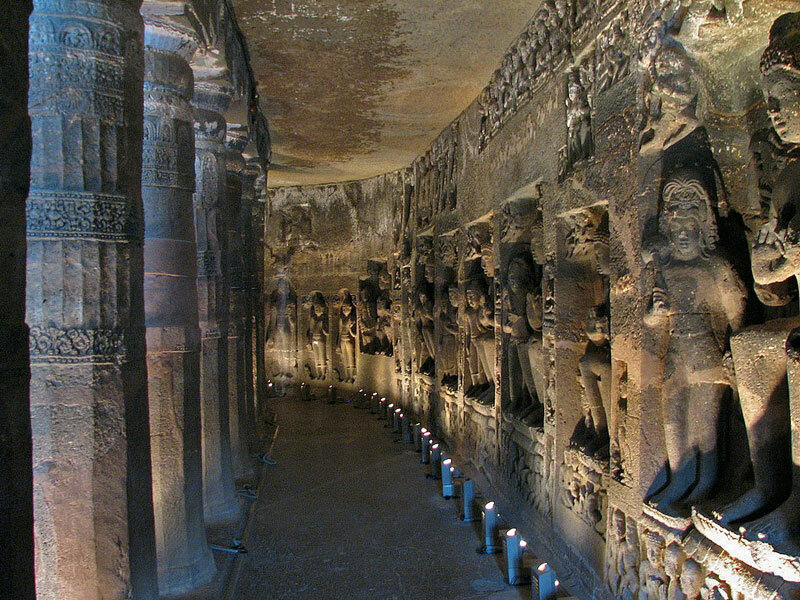 Ajanta Caves are one of the most exciting and scintillating places to visit. There is much to learn from the paintings that depict a beautiful religion. 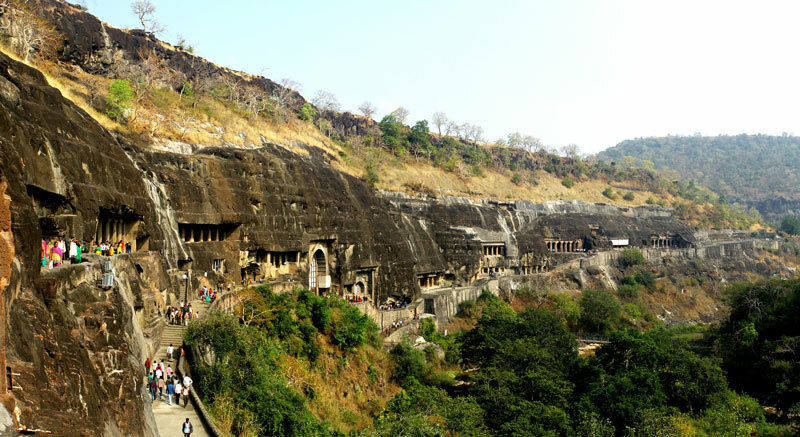 Next time you find yourself in Aurangabad, make sure to give these caves a visit. You will never regret it.